You are here: Home > Spring is here! 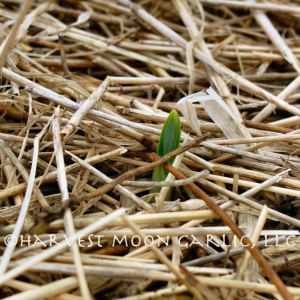 Seeing the first garlic sprouts make their way through the straw is a sure sign that Spring has arrived! This winter was very mild compared to the previous one, seems like we only had snow on the ground for a total of two weeks. Still, I am happy to see the plants start to green out and give us some color again. It looks like we are off to a good start this season and hope you look forward to enjoying some gourmet hardneck garlic!